A perfect 40 degrees. I rolled up a few minutes before the preruckers finished up, and assumed I was a half hour late when I saw that Rosetta Stone was with them. Given, then given again when Sonic arrived mid-WOR. Welcome to the Morg, Sonic! Commie successfully recited the F3 mission and credo, and Flobee and Wall Builder worked together to recite the 5 core principles. Thus, the PAX were rewarded with a standard warmup instead of 50 burpees. 21s, merkins and BBS. Rest break in the form of a 0.2 mile mosey lap after rounds 12, 15, 18, and 20. Saturday I had some commitments in the morning and evening, but my afternoon was free. I had been wanting to complete the January Ruck Callout – 12 miles in 3.5 hours or less. As the afternoon approached I was tired and cranky and didn’t really feel like doing it. But, #patch. And the weather was perfect for it. So I filled up my Source bladder and headed to the Greenline. I stepped off, and during the first mile I started to reassess my decision. Maybe I could just go 4 miles and turn around, and when I got back to the start point I’d have 8 down and the opportunity to decide whether to do the rest or call it a day. By the 1.5 mile mark I was leaning toward turning around at the 2 mile mark. But then, I passed Zima and The Streak. They had gotten there mid-morning, gone a full 6 miles before turning around, and were less than 2 miles from finishing. And they were moving – faster than I was. Seeing Zima moving quickly after 10 miles is no surprise – he’s a workhorse. But seeing The Streak keeping up with him changed my whole afternoon. The Streak just started rucking a month ago. His previous longest ruck was 5 miles. And he’s RESPECT RESPECT. That motivated me to stop the internal whining, speed up, and push through to the 6 mile mark before turning around. When you take the DRP and post, you’re pushing yourself to do better. But what you may or may not realize is that you’re also pushing your brother to do better. My COT today is a shout-out to The Streak – thanks for pushing yourself and inspiring me to do the same! QSource lunch has a new location this week: Whole Foods in Germantown. See you there Friday at 11:30! If you haven’t already, please fill out the 2F Lunch Availability form. I wish I had remembered to make these announcements this morning instead of just adding them here. SSH x 25 IC, Daisy Pickers x 15 IC, Imperial walkers x 15 IC, stretch what ails you. Being December 22nd, Santa has been getting his reindeer into shape for their yearly flight around the world. YHC was able to watch the exercises that Santa put each of them through, and modified these for the PAX. Divided the PAX into 3 teams, each reindeer game was a competition between the 3 teams…it was going to pay to be a winner, but time was getting short. Let the team pick the order by reindeer…I think this was the order. Vixen – Bear crawl indian run while rest of PAX do mountain climbers. Originally had 12 exercises that the winning team would pick the number and the losers would perform the work (think modified 12 days of christmas), but after 3 hill runs, 1 lap around the parking lot, 12 monkey humpers, 5 burpees, time was getting short, and there were some questionable reps by the “winning” teams…so we had to nix the extra work. The PAX weren’t necessarily sad. Let the Willy Loman from nashville pick the first exercise, he picked Freddie Mercuries. we did about 40ish in cadence. In honor of O Positive wearing his warrior kilt, we did hello dolly’s last. During this christmas season, our family has been going to several events with very talented people using their gifts to bring joy into the world, whether it being singing, playing instruments, or dancing. As Christmas nears, and we are giving gifts to those we love, I have been thinking about the gifts God has given all of us. 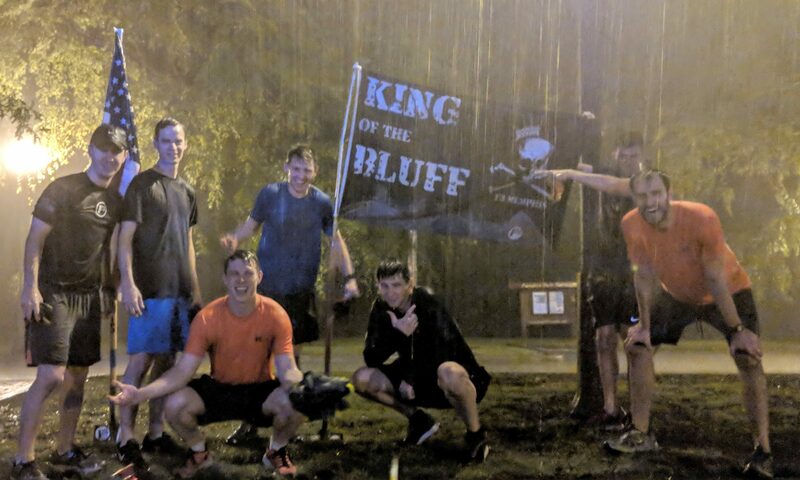 Starting with his son Jesus, God has bestowed on all of us some amazing gifts, that we don’t deserve, namely our faith, the ability to workout, a community, our jobs, and even this group of men that we call F3 memphis. YHC wanted to encourage the PAX to take a little time to reflect on the gifts that He has given us, and to encourage one another how to use those gifts to better the lives of others in our families, our vocations, and each other as well. Congrats on 3 men finishing Club 345 this week. T-claps to Judah, Flatland, and Handsy. THE SCENE: There are swarms of birds circling looking for food as is customary when tigers are hunting. 47, misty, dark and friggin damp. With Christmas less than 10 days away, today we will celebrate the 12 days of Christmas. As the song goes, you will complete item one, then two and one, then three, two and one and so on till we complete all 12 rounds of Christmas. With the holiday season upon us, the music at the mall announces that folks are dreaming of a white Christmas. That may be true. But in reality, many men are dreaming of something else white: a little more white space on our December calendars! Pageants. Parties. Shopping for the M. Wrapping nights. At every turn there are people to see, things to do, stuff to buy. The hustle and bustle of this supposed-to-be-happy season can knock the holly-jolly right out of our holidays and replace it with hurried-up headaches instead. In the midst of our holiday hustle and tasks, we could stop. We could slow down long enough to hurry in another direction. We could put our activities on hold so we might quietly meet with our Lord. We could be settled and silent in the presence of Jesus. Shout out to Yardsale for pushing himself and completing 345 today. Great job! As he said F3 is incredible and a great chance for us men to push ourselves and get better each day. Today is the Wearth Ruck at the Memphis National Cemetary. If you did not sign up, still show up and help out. This is open to the public and everyone can show up, only those that signed up will get a patch though. For those that have not done this before, it is a great chance to slow down and remember those that gave the ultimate sacrifice for the freedoms we have this holiday season. It’s summer again! Or something. Honestly, I have no idea what month it even is anymore. Disclaimed. Disclaimed again when Potiphar rolled up mid-WOR. Didn’t bother with a third disclaimer when Rosetta Stone rolled up at his usual time, mid-COT. I had planned some Grinch practice this morning, but as the clock struck 0530 there were only 3 PAX in attendance. All 3 were known to enjoy #ruckership, so an Omaha was proposed to those present: should we abandon the Grinch idea and get some milez instead? OJ did not have his ruck with him, but I had a spare – it was quickly and excitedly decided that we would ruck. We quickly ripped into our SSH like kids into their presents on Christmas morning. But what to our wondering eyes should appear? Another set of headlights pulling into the Morg: it was a ruckless Potiphar, here to crush our dreams and sentence us to 40 minutes of despair. Hand-Release Merkins are substantially harder than regular Merkins. Pull-ups are the devil. Unsurprisingly, the PAX leaned in strong and completed 3 full rounds and finished most of the 4th 800m run before time expired. Mary did not get hers today. Last week’s QSource lunch was on the subject of Preparedness: getting ready for the expected, while being ready for the unexpected. One of the ideas that stuck with me from that discussion was that the accelerant of Preparedness is love. It is love for our (spouse/kids/family/friends) that drives us to do the hard work that it takes to Get Right, Live Right, Lead Right, and Leave Right. If not for love, why would we bother? The other idea that stuck with me was that of being ready for the unexpected. That piece rolled around in my head for a few days before it triggered another thought: if I were to suddenly die, would my M know what she would need to know? How to file the life insurance claim? When/where to make the mortgage payment? How to file our income taxes? Each of us needs to have a little box or envelope with some basic instructions for things like this. Password to the bank account, copy of the will, location of your buried treasure, etc. Put it in a safe or a safety deposit box, and most importantly let your M know that it exists and where it is. If the worst-case scenario happens, she’ll have enough on her mind without having to worry about the technical details of keeping the lights on. Do this today. “The Grinch is easy”, said no one, ever. QSource lunch – 11:30 Friday at the East Memphis Whole Foods. 5 burpees every 30 seconds, for 12 rounds. Hadn’t prepared, but asked PAX to share glimmers of hope of past month. YHC shared praise for The Seeker’s employment! Other PAX mentioned positive relationships on the important things with their M & 2.0s amidst this season. One HIM mentioned a friend who struggled with depression who now empowers others to be an encouragement to folks who are considering taking their life. PAX enjoyed a free tour of Starry Nights, though it was such a cheap trick as we had no access to the corndogs/funnel cakes stand or petting zoo. And the lights weren’t even lit. 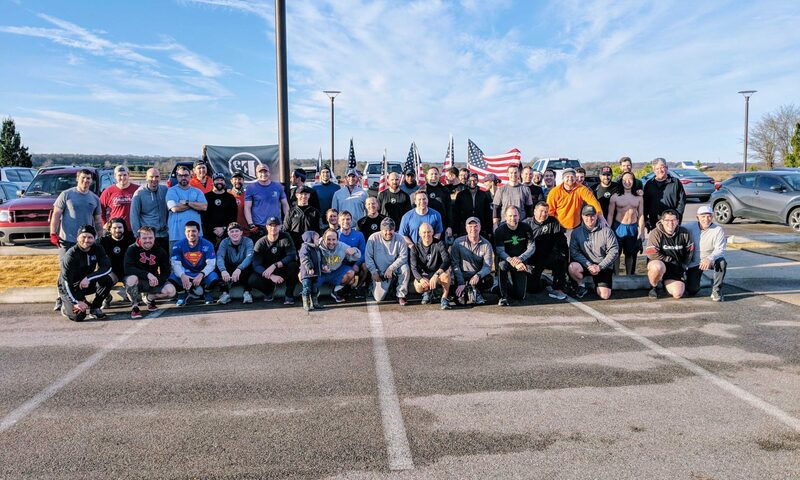 O Positive is pushing 19 x 19 to get guys to set goals of doing 19 events with other PAX in 2019. Check out #19-x-19 in Slack if interested. 12/10/18 – Starry Nights Ruck, see #ruckers if interested. Welcome and disclaim-ations provided. Twice in fact, but briefer the second time. The PAX moseyed over to the pavilion. This part of the workout was split up into a pairing of upper body and core. Then we wrapped up this round with a 1 minute hold of the People’s Chair. Next, we moseyed to next parking lot down from the pavilion. This part of the workout was split up into a pairing of lower body and core. Next, we rinsed and repeated… but backwards. More of a “yoyo” than “pearls on a string” type of workout. So, we did the lower body/core workout right where we were and then moseyed back to the pavilion for the repeat of the upper body/core workout. Finally, we moseyed back to STARTEX and arrived right at 6:15. No time, but we did plenty of it during the workout. A significant goal of F3 is to “invigorate male community leadership”… but what is leadership? Is a leader supposed to be out front or in the back? (trick question, the answer is “yes”) That being said, one of the most impactful courses I ever took while in college was called leadership strategies. The main book we worked through was titled “Influence” and some of the examples from it were how kids coming to your door “influence” you to buy something you would never actually buy (think a $5 candy bar). One of the biggest takeaways for me, though, was that a significant part of being a good leader is in influencing others in a positive way. Leadership is NOT (just) about getting people to do what you tell them to do. A biblical example of this concept is in Philemon. Briefly, Paul uses some pretty “influential” language to convince Philemon to accept Onesimus back. He doesn’t “command” him, but instead tells him that he “appeals” to him. He says he knows Philemon will “do even more than I say.” Paul really twists Philemon’s arm but uses his relationship and influence to encourage Philemon to do the right thing. We can think of plenty of other examples… in F3, we EH someone to get them to come out and work out with us and become a part of our community. We even have leaders who “watch the six” to make sure no one is left behind. So I would encourage you 1) to be more aware of the influence (and leadership opportunities) you already have in front of you and 2) to be more active in ensuring your example is a positive one. We didn’t get in the grass. The PAX appreciated this apparently. I had at least a couple guys mention thanks afterwards. So I got that goin’ for me which is nice. As I rolled up in the Morg, I thought to myself, “I should be sure to write my backblast today, because if I don’t I’ll forget about it for a week and by then I won’t remember much about The Scene or what happened during the workout.” As usual, I was right: I didn’t, and I don’t. I don’t specifically remember doing this, but no phalanges were mutilated so it must have been covered. Many moons had passed since my last AMRAPalooza, so I decided it was time for the next installment. Complete As Many Reps As Possible for one minute of each of the following exercises; take a break between exercises by completing one 0.2 mile lap around the parking lot. Silent prayer OYO for the Creeper van as you pass its sad, empty parking space. I’ve been in a bit of a lull, especially with my Queen for the past few months. I’m not where I should be after 10+ months of F3. It makes it a struggle to fight the pull of the fartsack some mornings. When you’re feeling like that, it’s more important than ever to keep taking the DRP. Decide the night before that you’re going to take it – don’t wait until the next morning, when the warmth of the fartsack can make a persuasive case for staying in it. When the alarm goes off, I know the workout is going to hurt. But I also know that what will hurt more is the feeling I’ll have around 6:30 when I start seeing the pics on Slack of the guys that posted. FOMO can be a strong tool – use it to your advantage. Always write your BB before the end of the day. Or be less old.